Anyone who drives a newer model diesel truck knows the importance of diesel exhaust fluid. This chemical, designed to mix with exhaust gasses and thereby reduce emissions from vehicles, must be added to trucks and SUVS manufactured after 2010. Higher horsepower farm machinery and construction equipment as well as diesel generators also require diesel exhaust fluid If a vehicle or machine that requires diesel exhaust fluid runs out of this additive, its power potential will be greatly reduced, and it will be unable to travel at speeds greater than a few miles per hour. Therefore, if you drive or operate such a vehicle or machine, it’s important to know locations of diesel exhaust fluid suppliers. The last thing you want is to find yourself without it and unable to reach your destination in a timely manner. So, obviously, running out of diesel exhaust fluid is a problem, whether you need it for your work truck, machine or you have to have it for the SUV you use to deliver your kids to school. It’s also important to know exactly how to get this essential fluid into your engine. You can typically locate the opening for adding it right beside your diesel tank entry point. Sometimes, especially in older cars and trucks, it may be located somewhere in the passenger space, trunk, or inside the engine compartment. For medium and heavy duty trucks, buses and machinery the diesel exhaust tank is usually positioned adjacent to the diesel tank. The diesel exhaust fluid tank is identified by its blue cap. You’ll need a funnel to safely and effectively deposit this fluid into your vehicle. Just insert the funnel into the diesel exhaust fluid entry point and direct the liquid into your car or truck. Your vehicle should have a sensor that will tell you when the fluid needs to be topped off. You can also look in your owner’s manual for an idea of when it’s time to add more. This is not really correct. Most jugs come with a spout and if you fill up at a truck stop or a fleet terminal there is usually a dispenser just like used for gas and diesel. 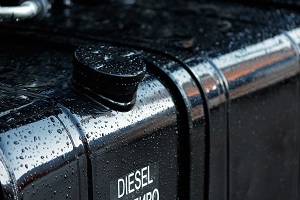 Keep in mind that you’ll need to establish which diesel exhaust fluid suppliers you want to use. Pick an auto parts store that’s easily accessible for you, as you’ll need to make this additive a regular purchase for your diesel vehicle. Just like visiting your favorite gas station, it will become part of your routine to swing by this retailer on a regular basis when it looks like you’re getting low on this fluid. You can take that opportunity to stock up on any other fluids you might need regularly, as well.